"Flammable" compartment tested and approved according to EN 14470-1 (04/2004) norm. Large warning labels in compliance with ISO 3864, 92/58/CEE European directive, EN 14470-1 (04/2004), and NF X08.003 norm. Allows segregated storage per product famillies. Fire resistance tested and approved by an independent European laboratory. 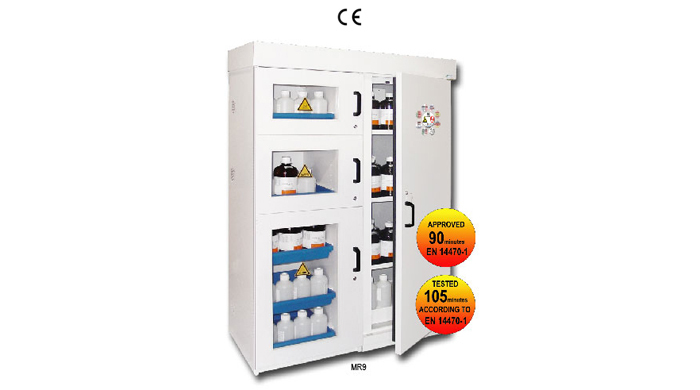 "Corrosive" compartments built in Cellular PVC, offering high chemical corrosion resistance. Storage in 4 separate compartments with ventilation (Ø100) centralized on the cabinet roof (for possible connection). Double wall construction: outer housing made of sheet steel; inner body made of H.P.L (High pressure laminated) coated sheet. "Flammable" and "No open flame" large warning labels. Opening vents with outlet Ø 100 mm for possible external connexion. In case of fire a thermo-fuse automatically seals off the ventilation system. Thermo-expanding seals off the door allow keeping the internal body fireproof. Self-locking door with cylinder lock. Possibility to keep the door open. If the temperature rises to 50°C, a fuse link closes the door automatically. Removable retention tank on the bottom. Built in white Cellular PVC. Handling glazed door with key-locking system. Handling glazed door with key-locking. Each compartment is divided in major and one (or two) secondary compartment (H 420 x W 110 x D 540 mm). The second one may be used for empty bottles storage. See table. Additional shelves (model: E8A2 and E794). Perforated cover plate (model: C794). Model Fire resistance (minutes) External Dim.